Eduardo Navas is the author of Remix Theory: The Aesthetics of Sampling (2012) and Spate: A Navigational Theory of Networks (2016). He is co-editor of The Routledge Companion to Remix Studies (2015). He currently researches and teaches principles of cultural analytics and digital humanities in the School of Visual Arts at Pennsylvania State University, PA. He is Research Faculty in the College of Arts and Architecture’s Arts & Design Research Incubator (ADRI), and a Center for Humanities and Information Research Fellow (CHI) also at Pennsylvania State University. Owen Gallagher is a lecturer of Web Media at Bahrain Polytechnic, specializing in graphic design, filmmaking, animation and interactive media. He received his Ph.D. in Visual Culture from the National College of Art and Design (NCAD) and has published a number of book chapters and journal articles on remix culture, intellectual property and visual semiotics, as well as presenting his research internationally. 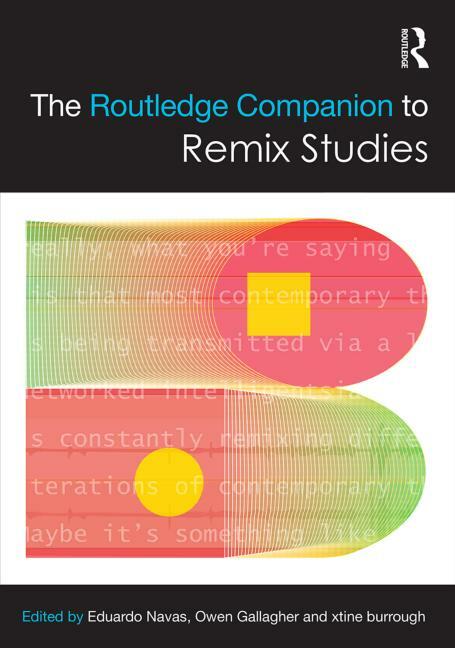 Gallagher is a co-editor of The Routledge Companion to Remix Studies (2015) and maintains a number of websites including totalrecut.com, an online community archive of remix videos, and criticalremix.com, an outlet for ongoing remix-related research. xtine burrough makes participatory projects for networked publics. burrough is co-editor of The Routledge Companion to Remix Studies (2015), author of Foundations of Digital Art and Design (2013), and editor of Net Works: Case Studies in Web Art and Design (2011). She is editor of The Visual Communication Quarterly. An associate professor in the School of Arts, Technology, and Emerging Communication at the University of Texas at Dallas, burrough co-directs the Social Practice & Community Engagement (SP&CE) Media Lab and LabSynthE, a laboratory for the creative investigation of synthetic and electronic poetry. Janneke Adema is a Research Fellow at the Centre for Disruptive Media at Coventry University (UK). She is the co-editor of two books, Really, We’re Helping To Build This . . . Business: The Academia.edu Files (London: Open Humanities Press 2016) co-edited with Gary Hall and Symbiosis (Michigan: Open Humanities Press 2011) co-edited with Pete Woodbridge. She has co-edited special issues of The Journal of Electronic Publishing and The Journal of Media Practice and has published in New Formations; The International Journal of Cultural Studies; New Media & Society; The Journal of Media Practice; New Review of Academic Librarianship; The Journal of Electronic Publishing, Krisis. Journal for Contemporary Philosophy; and LOGOS. The Journal of the World Book Community. Her research focuses on experimental publishing, the material-discursive practices of scholarly research and communication, book history, media studies, critical theory, remix, and radical open access. She blogs at https://openreflections.wordpress.com/. Yomna Ali, Samantha Close, Michele C. Forelle, Rogelio Lopez, and Emila Yang are PhD Students at the University of Southern California and members of the Civic Paths Research Group, which explores continuities between online participatory culture and civic engagement through outreach, creative work, and academic inquiry. The team is currently working on Popular Culture and the Civic Imagination:A Casebook. Patricia Aufderheide is University Professor in the School of Communication at American University, the author of, among others, Documentary Film: A Very Short Introduction and the co-author, with Peter Jaszi, of Reclaiming Fair Use: How to Put Balance Back in Copyright. The founder of the Center for Media & Social Impact at American University, she runs the Fair Use and Free Speech program there. Aufderheide has received Fulbright and Guggenheim awards. She has received numerous journalism and scholarly awards, including the Preservation and Scholarship award in 2006 from the International Documentary Association, a career achievement award in 2008 from the International Digital Media and Arts Association, the Woman of Vision Award from Women in Film and Video (DC) in 2010, and the George S. Stoney Documentary award from the University Film and Video Association in 2015. Aufderheide serves on the board of directors of the Independent Television Service, which produces innovative television programming for underserved audiences under the umbrella of the Corporation for Public Broadcasting. Thomas J Billard conducts research on transgender coverage in political media, transgender representations in mass media, graphic design in brand culture, and processes of production and encoding in graphic design. He holds a BA in political communication from the George Washington University and is currently a doctoral student in the Annenberg School for Communication and Journalism at the University of Southern California. Dahlia Borsche is research associate at Humboldt-University’s Trans-Cultural Musicology department in Berlin. Before, she had worked and lectured at the universities in Cologne and Klagenfurt (Austria) as well as at Free University Berlin. Besides her academic career she is co-curator of CTM-Festival’s discourse program (Berlin) and was active as a curator, promoter and DJane for many years. Her main research interests concern questions of contemporary popular and transcultural music processes and practices, thereby expanding traditional discipline boundaries to the fields of sound, media and cultural studies. xtine burrough makes participatory projects for networked publics. Her recent work recovers feminist texts through mediation and reimagines virtual crowd workers as bodies with agency. Using social platforms, databases, search engines, blogs, and applications in combination with popular sites like Facebook, YouTube, or Mechanical Turk, she creates web communities promoting interpretation and autonomy. burrough is passionate about using digital tools to translate common experiences into personal arenas for discovery. Emergent themes in her work include culture jamming, remix, appropriation, and translation. burrough has written, edited, and co-edited several books including The Routledge Companion to Remix Studies (2014), Foundations of Digital Art and Design (2013), and Net Works: Case Studies in Web Art and Design (2011). She is Editor of The Visual Communication Quarterly. An associate professor in the School of Arts, Technology, and Emerging Communication at The University of Texas at Dallas, burrough co-directs the Social Practice & Community Engagement (SP&CE) Media Lab with Drs. Olivia Banner and Kim Knight. She co-organizes LabSynthE, a laboratory for the creative investigation of synthetic and electronic poetry with Dr. Frank Dufour, and she is an Advisory Board Member of the Feminist Research Collective. Francesca Coppa is a professor of English at Muhlenberg College and a founding member of the Organization for Transformative Works, a non-profit established by fans to provide access to and to preserve the history of fanworks and culture. Her collection of transformative tales, The Fanfiction Reader: Folk Tales for the Digital Age (2017) was just published by the University of Michigan Press and she is currently writing a book about fan vidding. Owen Gallagher is a lecturer of Web Media at Bahrain Polytechnic, specializing in graphic and web design, filmmaking and sound design, 2D and 3D animation, VFX, game design and interactive media. He received his Ph.D. in Visual Culture from the National College of Art and Design (NCAD), a Masters in Design Communication from the University of Ulster and a Bachelor of Design in Digital Media from LYIT. 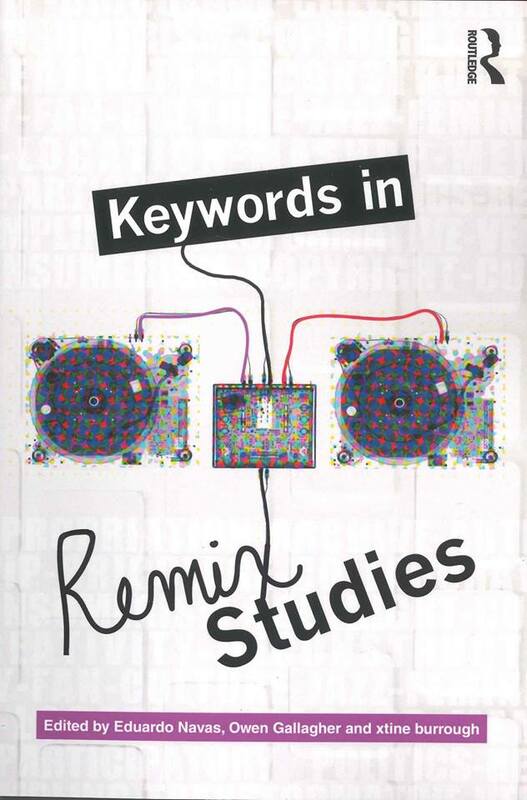 He is a co-editor of the Routledge Companion to Remix Studies (2014) and has published a number of book chapters and journal articles on remix culture, intellectual property and visual semiotics, as well as presenting his research at numerous international conferences. He has published a number of widely circulated remix videos online and is particularly concerned with the role of copyright in the digital age and its effect on remix creativity. Gallagher is a musician and songwriter and has played in a variety of bands over the past two decades, as well as producing and publishing both original and remixed music. He maintains a number of websites including totalrecut.com, an online community archive of remix videos, remixstudies.org, an archive of remix theory and praxis seminars, and criticalremix.com, a blog and resource for his ongoing remix-related research. David J. Gunkel is an award-winning educator and scholar, specializing in the philosophy of technology with a particular focus on information and communication technology. He is the author of over 50 scholarly articles published in journals of communication, philosophy, interdisciplinary humanities, and computer science. He has published seven books—Hacking Cyberspace (Westview Press, 2001), Thinking Otherwise: Philosophy, Communication, Technology (Purdue University Press, 2007), Transgression 2.0: Media, Culture and the Politics of a Digital Age (Continuum, 2011), The Machine Question: Critical Perspectives on AI, Robots, and Ethics (MIT Press, 2012), Heidegger and Media (Polity, 2014), Of Remixology: Ethics and Aesthetics After Remix (MIT Press, 2016), and The Changing Face of Alterity: Communication, Technology and Other Subjects (Rowman & Littlefield, 2016). He has lectured and delivered award-winning papers throughout North and South America and Europe and is the founding co-editor of the International Journal of Žižek Studies and the Indiana University Press book series Digital Game Studies. Dr. Gunkel currently holds the position of Presidential Teaching Professor in the Department of Communication at Northern Illinois University. His teaching has been recognized with numerous awards, including NIU’s Excellence in Undergraduate Teaching Award in 2006 and the Presidential Teaching Professorship in 2009. Nate Harrison is an artist and writer working at the intersection of intellectual property, cultural production and the formation of creative processes in modern media. His work has been exhibited at the American Museum of Natural History, the Whitney Museum of American Art, the Centre Pompidou, the Los Angeles County Museum of Art, and the Kunstverein in Hamburg, among others. Nate has several publications current and forthcoming, and has also lectured at a variety of institutions, including Experience Music Project, Seattle, the Art and Law Program, New York and SOMA Summer, Mexico City. From 2004-2008 he co-directed the Los Angeles project space ESTHETICS AS A SECOND LANGUAGE. Nate is the recipient of the Videonale Prize as well as the Hannah Arendt Prize in Critical Theory and Creative Research. Nate earned his doctorate from the University of California, San Diego’s Art and Media History, Theory and Practice Program. Nate also received a Bachelor of Fine Arts from the University of Michigan and a Master of Fine Arts from California Institute of the Arts. Nate serves on the faculty at the School of the Museum of Fine Arts at Tufts University, and lives in Brooklyn, New York. T Storm Heter teaches philosophy at East Stroudsburg University, where he also directs the Frederick Douglass Institute for Intercultural Studies and the Diversity Dialogue Project. He writes primarily about existentialism and race, and is the author Sartre’s Ethics of Engagement: Authenticity and Civic Virtue (Continuum, 2006). His current work focuses on jazz, race, and critical listening practices. He is currently completing a manuscript titled Clogged Up Ears: Jazz and Creolized Listening that explores discourses of racial authenticity in American jazz cultures. Heter is also a jazz drummer, who currently performs with the East Stroudsburg University Jazz Big Band Ensemble, under the direction of Matt Vashlishan. Henry Jenkins is the Provost’s Professor of Communication, Journalism, Cinematic Arts and Education at the University of Southern California and the founder and former codirector of the MIT Comparative Media Studies Program. His books include Textual Poachers: Television Fans and Participatory Culture, Convergence Culture: Where Old and New Media Collide, Participatory Culture in a Networked Era, and By Any Media Necessary: The New Youth Activism. Akane Kanai is an early career researcher and lecturer in Sociology and Anthropology at the University of Newcastle, Australia, with research interests spanning gender, race, and affect in visual, popular and digital cultures. Her recent PhD research has been published in journals such as Celebrity Studies, Social Media and Society, Feminist Media Studies, and the Journal of Gender Studies. She is currently working on a monograph for Palgrave Macmillan on youthful femininity, affect and identity in digital spaces. Karen Keifer-Boyd, Ph.D., is Professor of Art Education and Women’s, Gender, and Sexuality Studies at The Pennsylvania State University, and 2012 Fulbright Distinguished Chair in Gender Studies at Alpen-Adria-Universität Klagenfurt, Austria. Her writings on feminist pedagogy, visual culture, inclusion, cyberart activism, transcultural dialogues, action research, and social justice arts-based research are in more than 50 peer-reviewed research publications, and translated into several languages. She co-authored three books: Including Difference (NAEA, 2013). InCITE, InSIGHT, InSITE (NAEA, 2008), and Engaging Visual Culture (Davis, 2007); and co-edited Real-World Readings in Art Education: Things Your Professors Never Told You (Falmer, 2000). Keifer-Boyd is co-founder and editor of the international journal, Visual Culture & Gender. Christine Liao, Ph.D., is an Assistant Professor at the University of North Carolina Wilmington. She teaches arts integration to undergraduate and graduate in the Elementary Education program. Her research areas include media arts, digital performance, theorizing virtual body and identity, exploring interactions between virtual and real, STEAM, technology integration in art education, and community art. She has presented in national and international conferences including National Art Education Association (NAEA), American Educational Research Association (AERA), and International Society of Education through Arts (InSEA) and has published in Journal of Art Education, Visual Culture and Gender, Journal of Virtual Worlds Research, and Visual Arts Research. She also authored and co-authored several book chapters published by NAEA, Springer, and IGI Global. She is the Managing Editor of International Journal of Education and the Arts, Chair of the NAEA Art Education Technology Issues Group from 2013 to 2016, and Web Coordinator of NAEA Women’s Caucus. Christine received her Ph.D. in Art Education and minor in Science, Technology, and Society from Penn State University. Paul D. Miller aka DJ Spooky is a composer, multimedia artist, and writer. His written work has appeared in The Village Voice, The Source, and Artforum amongst other publications. Miller’s work as a media artist has appeared in the Whitney Biennial; The Venice Biennial for Architecture (2000); the Ludwig Museum in Cologne, Germany; Kunsthalle, Vienna; The Andy Warhol Museum in Pittsburgh and many other museums and galleries. His video installation “New York Is Now” was exhibited in the Africa Pavilion of the 52 Venice Biennial 2007, and the Miami/Art Basel fair of 2007. Miller’s award-winning book Rhythm Science was published by MIT Press 2004, and was followed by Sound Unbound, an anthology of writings on electronic music and digital media, published in 2008. Miller’s latest book is The Book of Ice (Mark Batty Publisher). Over the course of his career, Miller has collaborated with vast array of recording artists, ranging from Metallica to Chuck D; from Steve Reich to Yoko Ono. Miller’s large scale, multimedia performance pieces include “Rebirth of a Nation” (now on DVD), and “Terra Nova: Sinfonia Antarctica,” which was commissioned by the Brooklyn Academy of Music for the Next Wave Festival 2009. Eduardo Navas produces art and media projects, critical texts, and occasional curatorial projects. He has been a juror for various art organizations including Turbulence.org, Rhizome.org, and Terminal Awards. Navas was consultant for Creative Capital (NYC), 2008-09, and for The Herb Alpert Award in the Arts (LA), 2014-2015. He currently researches and teaches principles of cultural analytics and digital humanities in The School of Visual Arts at The Pennsylvania State University, PA. He is an embedded researcher in the College of Arts and Architecture’s Art & Design Research Incubator (ADRI), and a 2016-17 Center for Humanities and Information Research Fellow (CHI) at Penn State. He was a 2010-12 Post Doctoral Fellow in the Department of Information Science and Media Studies at the University of Bergen, Norway. He is an affiliated researcher at the Software Studies Lab, Cuny (2010-present). Navas is the author of Remix Theory: The Aesthetics of Sampling ( Springer, 2012) and Spate: A Navigational Theory of Networks (INC, 2016). He is co-editor of The Routledge Companion to Remix Studies (Routledge, 2015). Mark Nunes is Professor of Interdisciplinary Studies and Chair for the Department of Cultural, Gender, and Global Studies at Appalachian State University. He is author of Cyberspaces of Everyday Life (Minnesota, 2006) and an edited volume entitled Error: Glitch, Noise, and Jam in New Media Cultures (Bloomsbury, 2010). His current work explores how social media platforms operate as a context for challenging visual frames of reference for the personal, the political, and the historical. Recent publications include “Selfies, Self-Witnessing and the ‘Out-of-Place’ Digital Citizen,” in Selfie Citizenship, Ed. Adi Kuntsman (Palgrave, 2017), “Engaging Appalachia: Digital Literacies, Mobile Media, and a Sense of Place” in Carolinas Communication Annual 31 (2015), and “Ecstatic Updates: Facebook, Identity, and the Fractal Subject” in New Visualities, New Technologies: The New Ecstasy of Communication, Ed. Hille Koskela and J. Macgregor Wise (Ashgate, 2013). Richard Rinehart is Director and Chief Curator of the Samek Art Museum at Bucknell University. He has served as Digital Media Director & Adjunct Curator at the UC Berkeley Art Museum and as curator at New Langton Arts and for the San Jose Arts Commission. He juried for the Rockefeller Foundation, Rhizome.org, and others. Richard has taught courses on art and new media at UC Berkeley, UC Santa Cruz, the San Francisco Art Institute and elsewhere. He served on the boards of the Berkeley Center for New Media, New Langton Arts, and the Museum Computer Network. He has lead NEA and NEH-funded national research projects on new media, art, preservation, and museums. He has recently published a book with MIT Press on preserving digital culture, co- authored with Jon Ippolito – Re-Collection: Art, New Media, & Social Memory (http://re-collection.net). Aram Sinnreich is an Associate Professor at American University’s School of Communication, in the Communication Studies division. Sinnreich’s work focuses on the intersection of culture, law and technology, with an emphasis on subjects such as emerging media and music. He is the author of two books, Mashed Up (2010), and The Piracy Crusade (2013), and has written for publications including the New York Times, Billboard, and Wired. Prior to arriving at AU, Sinnreich served as Assistant Professor at Rutgers University’s School of Communication and Information, Director at media innovation lab OMD Ignition Factory, Managing Partner of media/tech consultancy Radar Research, Visiting Professor at NYU Steinhardt, and Senior Analyst at Jupiter Research. He is also a bassist and composer, and has played with groups and artists including progressive soul collective Brave New Girl, dub-and-bass band Dubistry, and Ari-Up, lead singer of the Slits. Along with co-authors Dunia Best and Todd Nocera, Sinnreich was a finalist in the 2014 John Lennon Songwriting Contest, in the jazz category. Sinnreich holds a Ph.D. in Communication from the University of Southern California, and a masters in Journalism from Columbia University. Rebecca Tushnet is a professor of law at Harvard. She previously clerked for Associate Justice David H. Souter and taught at NYU and Georgetown. Her work focuses on copyright, trademark, and advertising law. With Eric Goldman, she publishes a casebook on advertising and marketing law. She helped found the Organization for Transformative Works, a nonprofit dedicated to supporting and promoting fanworks. Her blog, tushnet.blogspot.com, is one of the top intellectual property blogs, and her writings may be found at tushnet.com. She is also an expert on the law of engagement rings. John Vallier has been Head of Distributed Media in the University of Washington Libraries since 2006. In this role he collects, preserves, and ensures access to a wide range of audio/video/film, including a large collection of Seattle area music. He has taught on a range of topics at UW, such as remix for Cinema and Media Studies, PNW music for the Honors Program, and collection development for the Information School. With Laurel Sercombe he co-taught courses about sound archiving in the School of Music. John has published articles for All Music Guide, European Meetings in Ethnomusicology, Oxford University Press, the Music Library Association, the International Association of Sound and Audiovisual Archives, and others. Before coming to UW, John was the archivist at the UCLA Ethnomusicology Archive, 2002-2006. At UCLA he conceived of community outreach projects—Archiving Filipino American Music in LA (AFAMILA) and Gospel Archiving in LA (GALA)—as well as other grant funded projects that focused on the preservation and repatriation of ethnographic sound recording collections. At UCLA John also co-taught courses on sound archiving with Anthony Seeger and worked with Lorraine Sakata on the preservation of Central Asian sound archives. As a drummer and percussionist, John has toured with indie-rock bands and performed/recorded original music for records, video games, and films soundtracks. Joshua Wille is a Ph.D. candidate in Film and Media Studies at the University of Kansas, where his research is focused on fan edits and film revisionism. His writing on the history, theory, and practice of fan editing has been published in Transformative Works and Cultures and in books such as Fan Phenomena: James Bond (Intellect, 2015) and Fan Phenomena: The Lord of the Rings (Intellect, 2015). As a fan editor himself, Wille created Watchmen: Midnight, which is an alternative version of the film Watchmen (2009) that more closely reflects the narrative structure, characterizations, and spirit of the original comics by Alan Moore and Dave Gibbons. Wille has delivered research-oriented presentations along with screenings of Watchmen: Midnight at fan conventions and academic events in the United States, Germany, and the Netherlands.